-I dug out about 12 gal. of soil and called Val explaining the soil-He said "keep on diggin, the more area I could get out the better". I ended up taking out 21+ gallons of soil and with a 1 1/2" spade bit loosened up the dirt I could no longer reach by hand. -Putting together the piping and routing to the attic was easy, the hardest part was the roof penetration (I hate cutting holes in my roof). -My system started pulling at 3.4"WC and about 2 weeks later dropped to about 3.2"WC and has remained there since. -A follow-up radon test resulted in 0.6 pCi/l. (I'd say the mitigation system worked). Thanks for all the advise Val and product recommendations. I compared Val's prices all over and he is as cheap if not cheaper than anywhere. Plus you get his advise. I spent a total of $380 give or take a few dollars for everything not including my labor. With quotes of $900 for exterior routing (did NOT want to do that) to $1350+ I think I saved a good chuck of change. Join in and write your own page! It's easy to do. How? 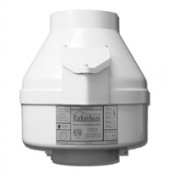 Simply click here to return to Do It Yourself Radon Mitigation Systems. Fantastic reduction 118 pCi/L to 0.7!! 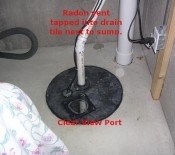 Crawlspace sealing is a necessary part of radon mitigation, if you have a crawlspace. See what products we recommend. Build Your Own Website with Solo Build It!